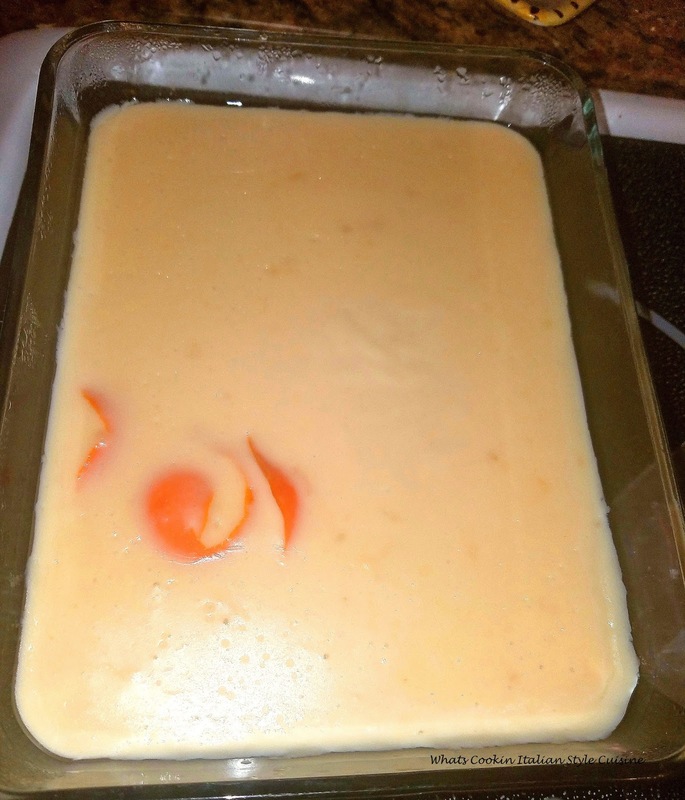 This is a cream pudding with orange flavor. Grandma's use to call it crem. The recipe is served every Easter for dessert. Grandma was 92 when she passed away and I still carry on her traditional pastry cream for dessert on Easter. This Italian Orange Pastry Cream has a distinctive taste, that is nothing like I ever had served before. It's a rich decadent kind creamy pudding, the texture is silky. For all you chocolate lovers, I also have the alternative recipe at the bottom. pictured . 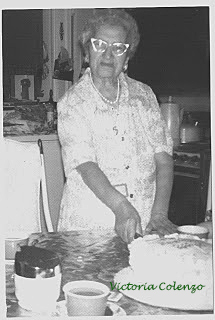 Our grandma lived to be 92 years old and born Rome, Italy. She would make this traditionally at Easter. She passed away in October 4th, 1976. 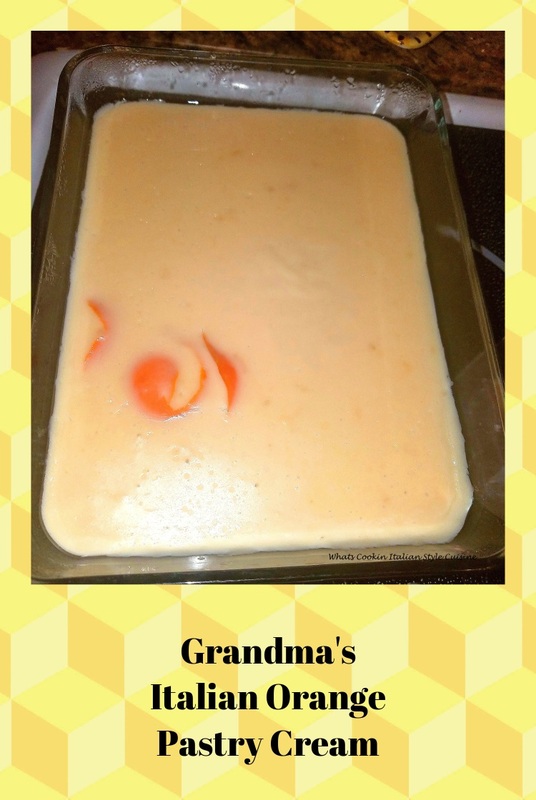 Melt butter in pan add flour stir till smooth no ,lumps ( I add to a blender and make sure it smooth then continue) add milk, beaten egg yolks, sugar, butter, vanilla, stir constantly until thick and creamy, if it gets too thick add a little more milk. Remove immediately from pot, stir in the peel, (or it will continue to cook) and then pour into a bowl. Cool with a piece of wax paper over the top and a teaspoon of sugar this will keep the skin from forming on top. In a small saucepan, warm the milk over low heat until warmed. After this milk is warming, whisk together the egg yolks, sugar, flour, cocoa powder, and cornstarch again the trick is to keep this completely smooth. Add the melted chocolate to it and whisk until it is fully incorporated into the milk. Add half of the chocolate milk, stir constantly, to the egg mixture. Add the milk and eggs back into the hot milk, continue stirring quickly, and heat it for 1-2 minutes, cook until it is very thick. Remove from the heat, stir in the vanilla extract, and follow same instructions on top to keep the skin off. That looks very good. I've always wondered how you get the eclairs stuff if you are making them at home. The chocolate looks so good! I think lemon would be great too. What a cool photo.